“Seize the moment. Remember all those women on the Titanic who waved off the dessert cart.” -Erma Bombeck | Food E.
Just a quick post to shout out a delightful little bakery in Williamsburg that could easily be transplanted to the English countryside or a quaint little town in Northern California. Not only was the ambience perfect for a sunny Saturday, but the flavor combinations of the baked goods were mind/tastebud blowing. 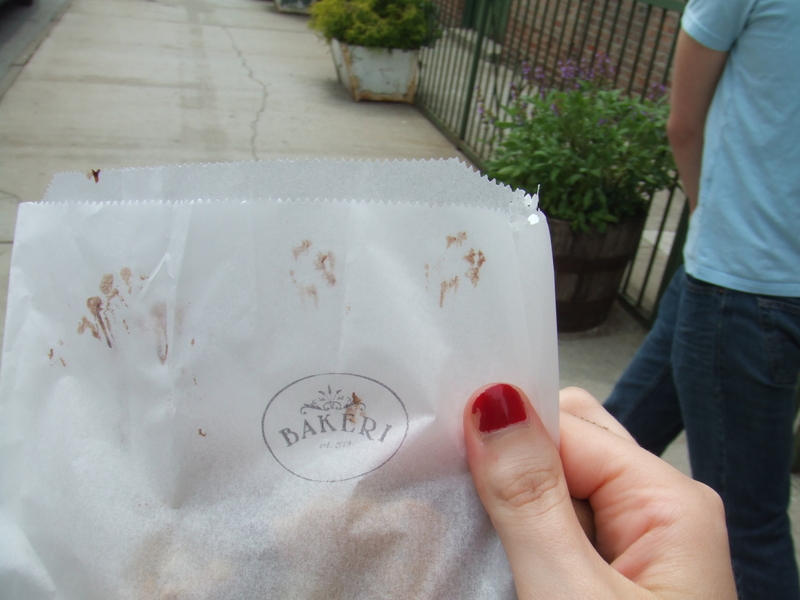 Bakeri 150 Wythe Avenue, btwn 7th St and 8th St, Williamsburg, Brooklyn, NY. The assortment of baked goods is incredible, and they also serve sandwiches, coffee, and other assorted drinks. Verdict: Sweet, cakey, salty, post-brunch heaven. I mentioned in a previous post that I am not opposed to dessert after brunch because it is technically a midday meal and technically I’m an adult and I can do whatever I want so THERE. Ahem. You might not think rosemary in a cookie would be so tasty, but the consistency was spongy but dense enough to hold up the flavor, and the chocolate was a nice balance to the salt. The muffin was sublime: the pistachio flavor pervaded and the raspberries were a nice sweet aftertaste.